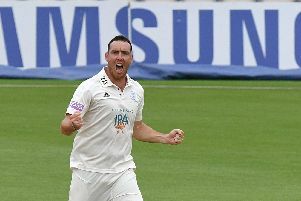 Kyle Abbott registered his best bowling figures of the season as Hampshire completed a 114-run victory over Worcestershire in the County Championship relegation battle at New Road. The South African paceman ended with six for 39 from 14 overs as Worcestershire, who resumed on 120 for eight, were dismissed for 133. 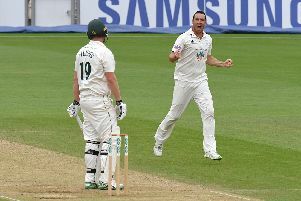 Abbott claimed one of the two remaining wickets to fall as he followed up yesterday’s first hat-trick of his career to finish with eight wickets in the game. Hampshire’s third win of the season earned them 19 points and lifted them above Lancashire into fifth spot. It enabled them to complete a double over their opponents and was the perfect response after last week’s hammering by an innings and 52 runs against current champions Essex at Chelmsford. Their experienced international pace trio of Abbott, Dale Steyn and Fidel Edwards were a handful throughout for the home batsmen in seamer-friendly conditions. Ball dominated bat throughout with the only half century of the game registered by Hampshire wicket-keeper Tom Alsop. While Hampshire have significantly boosted their hopes of survival, Worcestershire are now facing an uphill task to avoid an instant return to division two . They picked up only three bowling bonus points from this game and remain in bottom spot. The challenge to survive does not get any easier as champions elect Surrey head to New Road next week ahead of a visit to Essex and the final game of the campaign at home to Yorkshire. Worcestershire resumed on 120 for eight with Ross Whiteley unbeaten on 37 and Wayne Parnell 17 not out. A cover drive for four by Parnell against Steyn brought up the half century stand. But Abbott’s first delivery of the day accounted for Whiteley who was beaten all ends up and bowled without addition to his overnight score. Parnell and last-man Dillon Pennington hung around for nine overs. But it was Steyn who ended proceedings when Parnell on 26 nicked through to Jimmy Adams at second slip.